Presentation of the key characters that will take center stage of this Bible drama. 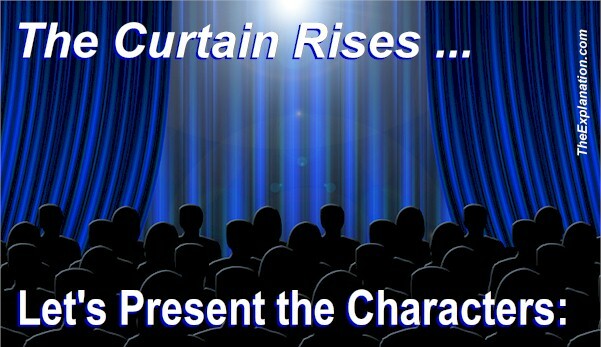 The curtain rises on our Bible drama. Let’s present our first characters. The opening frame of the movie shows heaven appearing. In our bird’s eye view at the moment, all we can distinguish is this vast space and a planet–Earth. God is present, but He chooses to show himself in His work. He is keeping a bit of the mystery, not appearing yet as a personage. 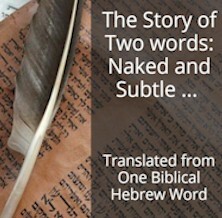 The Bible’s depiction is simpler—very basic stage direction. So begins the Bible, plunging us into a science fiction scenario, stating the origin of what we often take for granted, what is above and beneath us. This, of itself, merits a lot of explanation which is forthcoming—for now, think about Inventory of the Universe and chapter 1, Expanding Finity. From the very opening statement this ‘coming into existence’–even if we don’t know how–is a ‘given.’ There’s no asterisk to an appendix or Wikipedia to explain Who or What God is. In this initial statement He just is and He has the power to create. Even from a literary point of view, this is the scenario and I think these are logical conclusions. We will expound these point in due time. There is a corollary to this introductory phrase that I’d like to draw your attention to: God was on the scene prior to this creation. Logically He must’ve been there ‘somewhere’ before this beginning. The opening line of Genesis is not the beginning of God but of the heaven and the earth. It doesn’t tell us where God comes from, how He got there or how long He’s been around. Apparently, at this point in the story, those points are not of vital importance. Once again, nobody is asking you to believe this any more than you believe Star Wars or Harry Potter. If you like, just take it as a literary work that we’re analyzing–just like you’d do in a literature class. Following the initial statement the Bible runs the creation scenario, coming to the sixth day when Man and Woman are created. The animals and creepy-crawlies were also created earlier this same day. As a screenwriter would in the first ten minutes of a movie, we’re setting up the key characters and their relationships, so we’re skipping some context, to which we will return later. The fish and the fowl populate the earth. Squawking, swimming, squirming. But God has plans beyond just the animals. Like a master craftsman, He carefully, but effortlessly, creates people, strange and new individuals with bare flesh. Limbs, hair, eyes, chest, breasts, face. These are humans: man and woman. Notice that ‘God’, in this context, takes a plural pronoun: ‘let us…’ We’ll come back to this. They (God) create man with their own ‘image and likeness.’ No lengthy explanation here, even if it merits one. Suffice it to say it is very clear that there’s a rather special relationship between God and Man (of both sexes). Animals were not made with this divine ‘image and likeness’; not only does man possess this distinction but we see that man is also given dominion or ‘governance’ over the animals. Ever heard this: ‘You’re the spitting image of…’ or ‘When you do that, you are just like…’ With this one short clear ‘resemblance statement’ in Gen 1.26, we are given two basic principles that give us insight into the kinship of God, humans (man and woman) and animals. God created both humans and animals, yet humans have a special close relationship with God; moreover, God does not have this relationship with animals. Man does have a relationship with animals; specifically, he has ‘dominion’ over the fauna. Most people find the connotation of ‘dominion’ dreadful and we will clarify its meaning shortly, let’s say here that man is put in charge of taking care of the animals. In the chain of command animals are ‘under’ man. Be assured that the translation ‘dominion’ does not mean man can do whatever he wants with animals. Galacti gently nudges us to look at the man. Surprises on the stage! What is Man doing?